Perfectly seared steak, crispy skinned chicken, and caramelized pork chops are all made possible by grilling with indirect heat. What is indirect grilling? The process uses the same grill that you pull out for a summer barbecue, but a few technical peculiarities make up a delicious difference. It allows you to cook loads of new foods on the grill, and only takes a few points of practical know-how. Let’s check out some details on getting started, then we can talk about some great dish ideas to test out the process. Grilling with indirect heat is also known as two zone grilling. This is because you are creating two areas to grill. One will have the charcoal or fire directly below, which is direct heat grilling; the other area will not have a source of heat directly below. The area without heat below is the indirect grilling area. By keeping your grill’s lid shut, you allow the charcoal or fire to heat up the enclosed air. The air that is surrounding your food will cook it, instead of the fire itself. By placing food directly over the source of heat, you are increasing the cooking temperature drastically. This is great for searing the outside of meats and creating those awesome looking grill marks, but not so perfect for cooking foods through. A slow, steady heat is necessary to cook thick foods or foods that can’t handle a rapid increase in temperature. By heating the food indirectly, it cooks from all sides. Think of it like baking but with the added benefit of delicious wood smoke flavor. Because of this, make sure you always grill indirectly with the grill’s lid shut. You will be greatly disappointed trying to grill with an open lid and no direct heat. By trapping the air and heating it, you are cooking the food slowly and thoroughly, and grilling with indirect heat! Will It Work On Both A Charcoal And Gas Grill? I personally think that indirect heat grilling works best with a charcoal grill. It is still possible with a gas grill, but it needs to have at least two burners, which are individually controlled. Having an area away from direct fire is the entire purpose of this type of grilling. Without individual control of both burners, it can be difficult to create an area without direct heat. You can attempt to divert heat by using a drip tray, but I’ll get into that later. Direct heat on a grill is fantastic for many types of food. Food that cooks quickly is a notable example; things like thin steaks and hamburgers are ideal for direct heat grilling. Indirect grilling can be utilized in several ways, acting as both a compliment and an addition to direct grilling. Whole chickens, roasts, or tenderloins are some things to grill with indirect heat. These large pieces of meat can take a while to cook thoroughly. If you keep them over direct heat the whole time, you can end up with a burnt piece of meat, or tough meat from being overcooked. Instead, try starting with direct heat, then moving these foods over to the indirect area. You get a nice sear at first, then slowly cook through the meat, allowing it to stay moist and avoid burning. Another great option is the reverse sear method, which is pretty much the exact opposite of the process noted above. You start with indirect heat and finish the cook with a nice hot sear using direct heat. You can read more on the reverse sear method here. 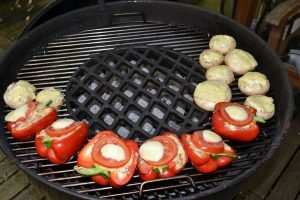 Two zone grilling can be used to cook potatoes and other vegetables as well. Treated like an oven, indirect grilling will cook the vegetables to a tender consistency without burning them while adding the woodsy, smokey flavor we all crave. When you have a party over for steaks it can be difficult to time them to all finish cooking at the same time. Indirect grilling lets you time steaks together consistently. If you notice some steaks cooking quickly, or if someone wants a more rare steak, you just move the steak over to your indirect area. The steak will stay hot, but not cook quickly, letting the others catch up. What Is Indirect Grilling When Assembled? Indirect heat grilling is made possible in the assembly or setup of your grill. 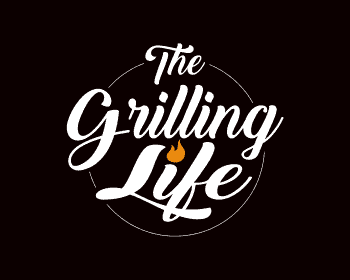 Depending on your type of grill and its design, you can easily start grilling with indirect heat, or you may have to play a bit in order to make your grill capable. For gas assembly, just light one of your burners while leaving the others unlit. The lit burner will be your direct heat while the unlit areas are for indirect heat. Light your charcoal using a charcoal chimney starter or whatever charcoal lighting technique you prefer, but make sure the coals are completely lit and ready to go. Once the briquettes are white and ashy you should be all set. Next, push all the coal to one side of your grill, spreading it out evenly like you would normally. The side with coals will be your direct heat source, allowing you to quickly cook small meats and sear larger ones. The side without charcoal is your indirect heat side. Another option is to make a ring of lit charcoal around the edge of the grill, leaving the very center bare. That way, your direct heat is around the edge, and the indirect heat is in the center, allowing for an even cooking area for indirect heat. Like with direct heat grilling, controlling the temperature is still very important. Since the trapped air is a large part of what cooks your food with indirect grilling, try to keep the lid shut as much as possible. With charcoal grills, you will need to play a bit with your air vents. Allow enough air through to increase the temperature while also taking into consideration that every time you open the lid you are allowing a gust of air in and heat out. 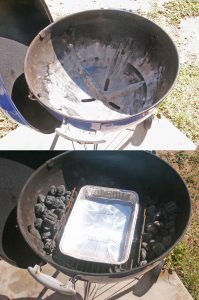 The increase in oxygen from opening the lid increases the temperature with a charcoal grill, but the release of heated air can make for a strange balance. Play around with the settings on your vents in order to even out the temperature. If you have the option, using a water pan is a terrific way to improve your indirect grilling. To use a water pan, your grill needs a second rack underneath your cooking area, or at least a space to place the water pan. Take a metal drip tray and fill it about two-thirds of the way with water. You can add veggies, wine, cider, beer or other additives as well. I personally enjoy plain water. Place your tray on the lower rack. If you have a grill without individual burners, you can utilize a water tray to diverge one burner’s heat, giving you an indirect heat area. The additional water keeps your food nice and moist, sort of like a sauna. Also, if the tray is positioned under the meat, it will catch any drippings and stop flare-ups from the fire. This allows you to baste your food if you’d like. So really, what is indirect grilling? It is another tool within the grilling realm. It is a twist on more common grilling techniques. While it does not completely replace direct heat grilling, indirect heat is a terrific addition. Just like with direct heat, it is something to play with. 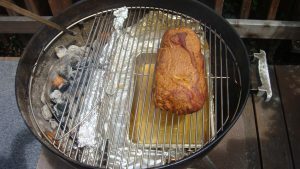 I shared a few of my favorite ways to use indirect heat grilling. Take those, and experiment with your own ways. If you find something that works well or a recipe you are proud of, let me know! I am always happy to hear new and improved ways to use the grill.